Exploring the echoingly empty gulfs between intimacy and isolation, between yearning for truth and the need to keep some secrets unspoken, Charlotte Jones’ new play The Meeting has a quiet but deeply moving intensity. 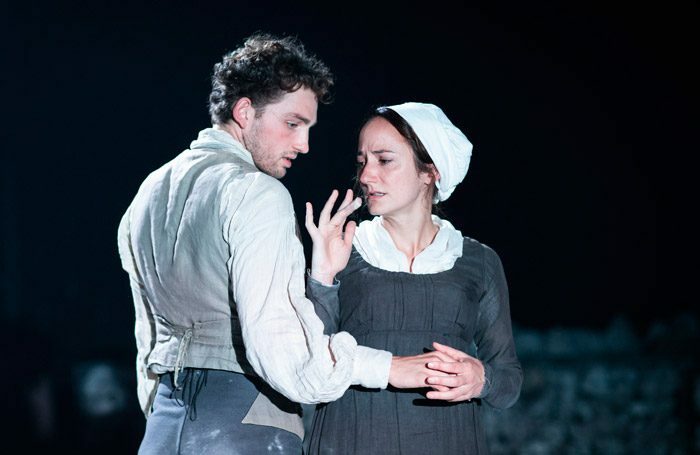 Set during the social upheaval of the Napoleonic Wars, when Quaker pacifism collided with nationalistic belligerence, it is, at its core, a simple love triangle encompassing a spiritual stonemason, his troubled wife, and the traumatised soldier they take in. Director Natalie Abrahami lets silence proliferate in the space like shadow, dense and atmospheric, giving the audience time to dwell on the inevitably unfolding drama. Whenever characters sit in prayer or pause mid-conversation, a dance of subtle glances and telling looks takes place. D/deaf performer Jean St Clair makes herself a fierce and commanding presence through gesture alone, making every shrug and piercing stare unmistakably eloquent for the characters around her who have never tried to learn her fluent sign language. Lydia Leonard is similarly superb as her daughter Rachel, suffocating in her own guilt and shame, struggling to make herself heard by her kindly but emotionally wounded husband – played with great gentleness by Gerald Kyd. Vicki Mortimer’s stage design is striking, a great disk of flagstones set in a granite grey slope, surrounded by cages of raw rocks and honeycombed with prop- concealing trapdoors. Cold and monumental, it evokes both the chalk and flint of the play’s Sussex setting, and the measured but stifling austerity of the insular community at the tale’s heart.